The ColorFlex EZ (CFEZ) instrument is ideal for measuring certain food products. 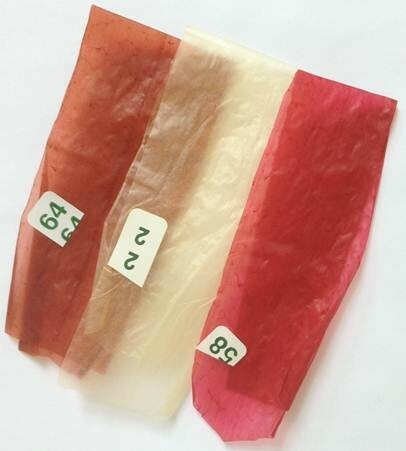 One such food based products that can be measured using the CFEZ is collagen sausage casings. Collagen is used as a meat casing because it is safe, versatile, cost effective, and is liked by consumers. Collagen casings are a manufactured product and generally speaking it is easier to control the color over a natural product. By controlling the color of the casing the customer can produce consistent sausages that have the same color, shape, and tenderness which appeals to consumers. The collagen casings (pictured above) are approximately 1.25 inches to 2 inches. The size and nature of the casings make them an ideal sample for the ColorFlex EZ instrument. The CFEZ instrument is compact, fast, and measures a 1 inch area. The casings are translucent and need to be backed to ensure consistent measurements; the CFEZ white tile works perfectly for this purpose. A consistent measurement method was obtained by using the largest area of view possible, backing the sample with the white tile, and averaging a total of 3 measurements. The CFEZ is a robust instrument that is ideal for a wide variety of industries, including food applications. The CFEZ ease of use and area of view make it perfect for measuring these collagen casings in a repeatable manner.